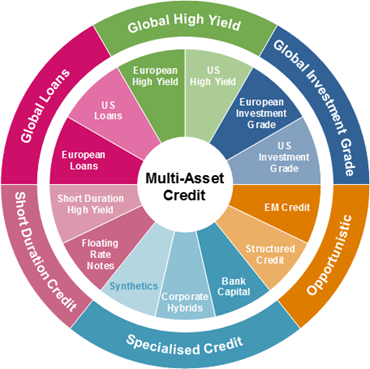 We believe a Multi-Asset Credit (MAC) strategy can offer higher yield while controlling risk by diversifying across different credit segments. A MAC approach can also have low interest rate risk through the use of loans and high yield bonds with low duration. In addition, with volatility within financial markets becoming ever more common, we believe a flexible and reactive investment strategy will be far better placed to navigate through different market conditions. Our MAC Strategy has its core focus in each of the significant developed global credit markets (Investment Grade, High Yield, and Leveraged Loans) including the specialist sub-sets within these markets. Alongside this core focus, we can opportunistically allocate to Emerging Market Credit and Structured Credit, should we see sufficient compelling value. Across these markets we seek to target the most efficient use of capital using security selection, beta management and asset allocation as sources of alpha. This dynamic portfolio will evolve and adapt to market conditions, value, risk premia and liquidity. Given our unconstrained approach to investing, the MAC portfolio consists of our best ideas across the credit spectrum, with complete benchmark independence in asset selection. We fundamentally believe that constructing portfolios bottom-up, in a risk-controlled manner, ultimately leads to a better investment result. *These internal parameters are subject to change not necessarily with prior notification. Bigger investable universe from which to choose, allowing for a wider opportunity set. Credit asset class diversification leads to a better spread of risk and also less propensity for unproductive index biased investing. Pricing inefficiency caused by individual asset class flows can create over or under valuations between asset classes. Similar risk can often be mispriced between markets due to illiquidity premiums or structural complexity. Credit asset class complexities are simplified through a single MAC solution where the manager deals with all implementation, structural and liquidity considerations. This approach led to dynamic asset allocation across the credit markets, regionally and by asset class, which was a key driver of performance. The performance through the year also illustrated the benefit of diversification across different sources of return, with robust performance through a variety of significant events. A well-diversified portfolio, addressing investors’ need for risk-controlled income in today’s low-yield environment. Targeting a total return in excess of 4% p.a. above 3 month LIBOR gross of fees over a full credit cycle**. Unfettered by region or benchmark. Region and benchmark agnostic. Managed by a single, globally integrated team operating as a coherent unit. Experienced professionals with a thorough understanding of the multi-asset credit markets, with an average of over 14 years industry experience. Integrated with a well-regarded Multi-Asset and Emerging Market Fixed Income team. Dynamic and disciplined screening identifies a wide range of opportunities enabling us to construct a ‘best ideas’ portfolio. Careful security selection and rigorous management process built around our bespoke ‘Compelling Forces™' investment framework. Currency exchange: Changes in the relative values of different currencies may adversely affect the value of investments and any related income. Default: There is a risk that the issuers of fixed income investments (e.g. bonds) may not be able to meet interest payments nor repay the money they have borrowed. The worse the credit quality of the issuer, the greater the risk of default and therefore investment loss. Derivative counterparty: A counterparty to a derivative transaction may fail to meet its obligations thereby leading to financial loss. Derivatives: The use of derivatives may increase overall risk by magnifying the effect of both gains and losses. This may lead to large changes in value and potentially large financial loss. Interest rate: The value of fixed income investments (e.g. bonds) tends to decrease when interest rates and/or inflation rises. Liquidity: There may be insufficient buyers or sellers of particular investments giving rise to delays in trading and being able to make settlements, and/or large fluctuations in value. This may lead to larger financial losses than might be anticipated. Loans: The specific collateral used to secure a loan may decline in value or become illiquid, which would adversely affect the loan’s value. Many loans are not actively traded, which may impair the ability of the Portfolio to realise full value in the event of the need to liquidate such assets. Multi-Asset Credit: Friend or foe of direct lending? Since the 2008 global financial crisis, we have seen significant allocations to alternative credit. These allocations are generating growth in diversifying go anywhere strategies like Multi Asset Credit (MAC) and also in less liquid strategies like private debt. This paper compares the virtues and challenges of each approach, as well as assessing how complementary these strategies are to each other. All information is as at 30.06.18 unless otherwise stated. **Performance target: In excess of 3m USD LIBOR +4%, This represents a return target, not a guaranteed return.